In 2018, SODES joined the Port of Québec and Ocean Group to make an ice canoe marine team called Livré par navire/Océan/Port de Québec. During the season, the team took part in seven races (Rimouski, Québec City, Montréal, Charlevoix and Sorel-Tracy). The team also met with young people in a number of Québec City area schools to tell them about the discipline and distribute Livré par navire/Brought to you by ship “tattoos”. 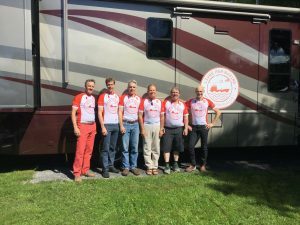 SODES was the proud partner of the Lower St. Lawrence Pilots’ team that will take part in the 1000-km Grand défi Pierre Lavoie on June 16, 17, 18 and 19. For the Grand défi, each team registered had to partner with at least one elementary school of its choice, get the school to sign up for the Energy Cubes Challenge and act as a kind of sponsor for students’ healthy lifestyles. The Lower St. Lawrence Pilots’ team sponsored the École Dominique-Savio in Les Bergeronnes and École Saint-Joseph in Tadoussac. When it visited the schools it is sponsoring, the Lower St. Lawrence Pilots’ promoted the game Brought to You by Ship and gave a Rubik’s Cube sporting the Brought to You by Ship colours to each youngster. The Montréal – Québec Desgagnés Kayak Challenge is a fundraising activity for Jeunes musiciens du monde in which participants kayak the St. Lawrence River from Montréal to Québec City in four days. Given the success of the first edition, in 2015, the Montréal – Québec Desgagnés Kayak Challenge was back in full force in 2016. SODES decided to support the organization more substantially this year, entering a team wearing Brought to you by ship – My river, my provider! colours and comprising Laurie Grenier, Communications Coordinator and person responsible for the promotional campaign at SODES, and other members of the marine industry. In 2018, SODES and many of its members rallied to support this noble cause.